Hitman 2, the highly anticipated sequel to the 2016 Hitman reboot is finally here, ditching the episodic release format of the first game and giving us six awesome locations to explore right away, alongside a bevy of content to mess around with. Hitman 2 succeeds on doubling down on a gameplay formula that has already proven itself to be extremely popular, and despite some minor shortcomings with its narrative and performance issues IO Interactive have yet again managed to craft an insanely deep assassination sandbox for us all to play with. Hitman 2 sees series protagonist Agent 47 on a globetrotting journey to track down an individual known as the Shadow Client, whilst taking out his colleagues in the process. Completion of the mission will result in information about Agent 47’s past, of which the shady figure has no recollection. Hitman 2’s story is too much of a mess to really enjoy, as the narrative is far too sparse and difficult to grasp. There are short static cutscene segments between each level that serve to pad out the story, but they fail to make much of an impact. I did find myself enjoying small aspects of the story, particularly the game’s unexpected reveal just before the credits roll, but most of the scenes that were supposed to be emotional failed to grab me, as the characters are nowhere near fleshed out enough to warrant caring for. I found myself wanting to care more about Agent 47 and his handler Diana Burnwood, but sadly the narrative failed to give me a connection to these characters. While the story may not be worth your time, it is quite the opposite when it comes to gameplay. 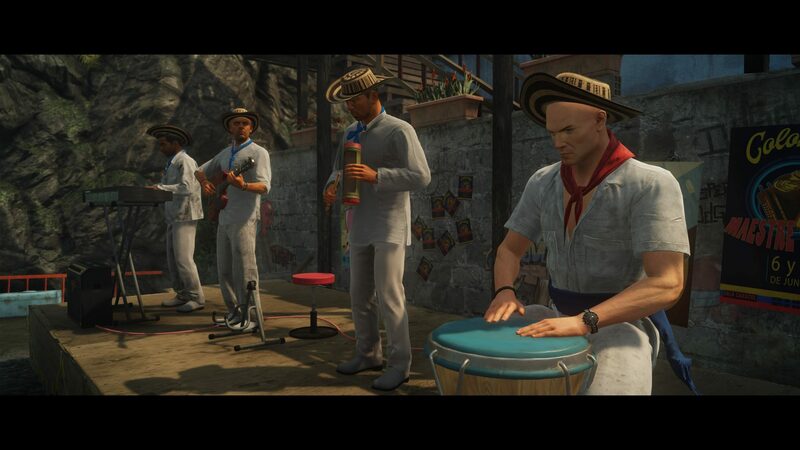 Hitman 2, much like the 2016 reboot, is a pleasure to play. As Agent 47, you arrive at your location with the task to assassinate a certain individual or individuals, depending on the mission. The way in which you go about making the assassination is completely up to you, offering up a myriad of ways to kill of your enemy. Do you want to simply shoot them and get out as soon as possible? Do you want to disguise yourself as someone they trust before you make your move? Or are you more keen on the idea of poisoning their food with rat poison? The opportunities feel seemingly endless, and each level is at the perfect length where the idea of experimenting with different approaches each time is something you’ll want to do. Replayability of each map also comes in the form of contracts, which are user generated missions. These missions are great additional challenges to try, and add even more replay value. 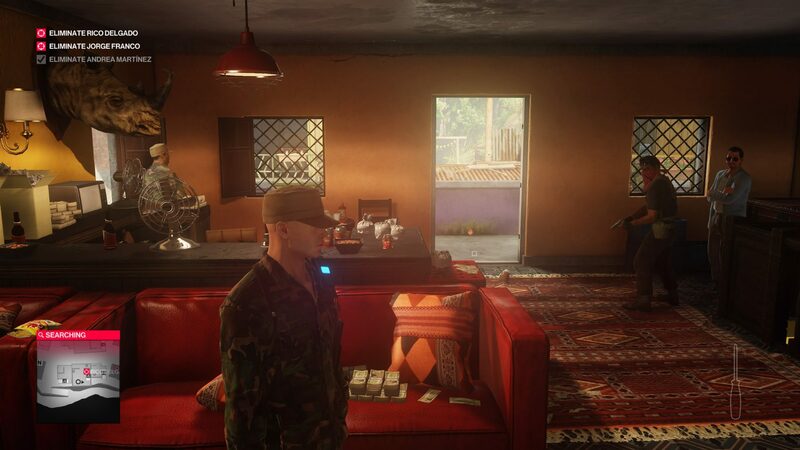 The locales you visit throughout Hitman 2 all feel rather different to each other, allowing for different approaches. For example, the bustling streets of Mumbai make it much harder for you to be able to stealthily take out your target, but they make it far easier to hide among the vast crowds of people when you try to get away from those who are suspicious of you. Speaking of people being suspicious, the AI of all the NPCs is pretty impressive. If you lurk around or get in people’s faces, they will start to grow suspicious. Some people are also smart enough to see through your disguises, so you’ll still need to be safe even when you’ve got on the right kit for the area you’re traipsing through. Costumes, whilst being a good way to not alert people, are also just damn funny to wear. 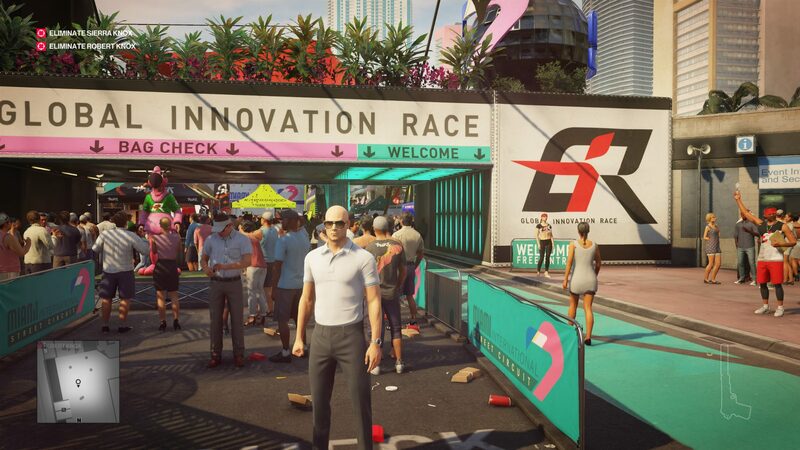 Hitman 2 is basically a pseudo-puzzle game – you find what costumes and tools you’ll need to achieve your goal, and you connect every piece of the puzzle in order to get that satisfying undetected killer blow. Hitman 2’s gameplay is succinct and satisfying, and the sheer amount of different ways in which you can go about completing your mission ensures that the six maps can be run through plenty of times without feeling stale. Check me out! I’m in a band! Alongside the new Hitman 2 maps, you can also play the maps from the original Hitman, if you decide to purchase them. 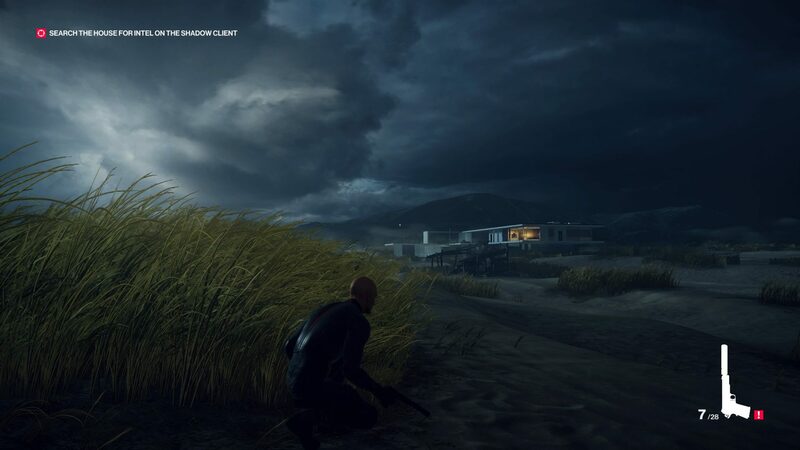 If you already own the original Hitman you’ll get these levels free of charge, which is pretty awesome, as they have been updated with new gameplay features that appear in Hitman 2, such as the ability to hide in foliage, as well as new difficulty options and items. There are other game modes to tinker with also, such as the Sniper Assassin game mode. 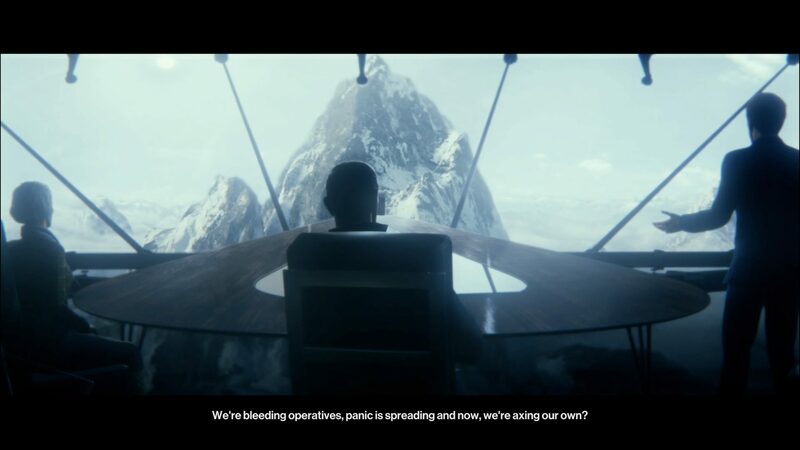 This mode sees Agent 47 perched on a mountain side with a sniper, tasked to take out select targets. There is no movement in this game mode, leaving you to pick off your targets from afar. This mode is not as great as the core mode gameplay, but it is an enjoyable additional piece of content to mess about with. 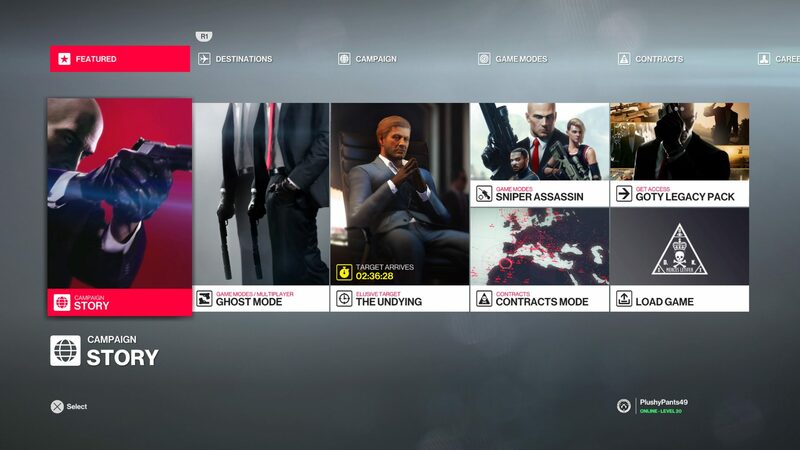 Ghost Mode is also available, allowing you to compete with fellow assassins online. Whoever can assassinate five selected targets before their opponent is crowned the victor. Sadly I couldn’t find anyone when lobbying up on the game to try this mode out, and a good community is going to be vital for a mode such as this to survive. Although I loved playing through Hitman 2 I did have a few issues with the game that hampered my experience. My biggest issue with the game was the aforementioned narrative, but I also struggled with bugs and crashes that seemingly siphoned all immersion whenever I was starting to get hooked. The Hawke’s Bay map had a weird invisible wall that I found myself running in to a couple of times, while the Santa Fortuna level located in Colombia had a camera bug in which the perspective would go first person and the textures would freak out. I also encountered numerous crashes throughout my time with Hitman 2, some of which my PlayStation 4 recognised as being a crash, while for some reason other times it had no clue. The game would lock up in the menu, and despite the fact my console allowed me to navigate the PS4 home screen, whenever I popped back in to the game, the game still wouldn’t recognise any of my controller inputs. These issues aren’t the be all and end all, but they do detract from the pristine polished gameplay. Hitman 2 may play almost exactly the same as the 2016 reboot, but that’s exactly what Hitman fans wanted. The story may leave much to be desired, and the incessant crashing and bugs may sully what is otherwise an impressive game, but despite my gripes I can’t help but keep playing each level repeatedly. The levels are great, the game is a treat to play and the sheer amount of freedom you have when approaching each level is impressive to say the least. Hitman 2 is great fun, and I highly recommend you give the game a try.